Providence, RI (10/9/2010): The Springfield Falcons invited the R. I. Reds Heritage Society to participate in pre-game ceremonies for the team’s 2010-11 home opener against the Providence Bruins at the MassMutual Center in Springfield on Saturday, Oct. 9. The game marked the start of season-long celebration of the American Hockey League’s 75th anniversary. Both teams took the ice wearing throwback jerseys honoring their origins. In an exciting, wide-open game, the Bruins edged the Falcons, 6-5, before 6344 Springfield fans. Bob Oliver, senior vice president of the Falcons, extended the invitation by phone in early September to Buster Clegg, president of the R. I. Reds Heritage Society. “It came as a complete and pleasant surprise. Naturally, we immediately accepted his kind invite,” said Clegg. The Falcons’ opener also involved the fledgling Springfield Hockey Heritage Society, headed by Steve Bourdeaux, whose organization’s objectives are common with our 10-year old Society. 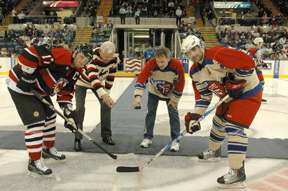 A ceremonial opening “puck drop” featured Bourdeaux and Clegg, each wearing throw-back jerseys from their Springfield Indians’ and R. I. Reds’ legendary legacies. “Steve and I and our historical organizations are working towards the same goals. We are really excited about the growing support from the AHL and its member teams to respect and back the efforts to restore and preserve the origins of pro hockey in the league’s franchise areas,” added Clegg. R.I. Reds Heritage Society President Buster Clegg and Springield Society President Steve Bourdeaux drop ceremonial pucks.